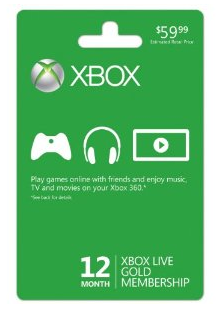 Amazon is offering a Xbox LIVE 12 Month Gold Membership card for only $34.99. Regular price $59.99. This ships for FREE with Super Saver Shipping or Amazon Prime. This would make a great gift! I am not sure if you will be able to price match this at Target because it seems kind of “gift-cardy” to me (I totally made that word up). If anyone gives it a try, let us know how it goes. Amazon prices can change at anytime, this price was valid when posted.